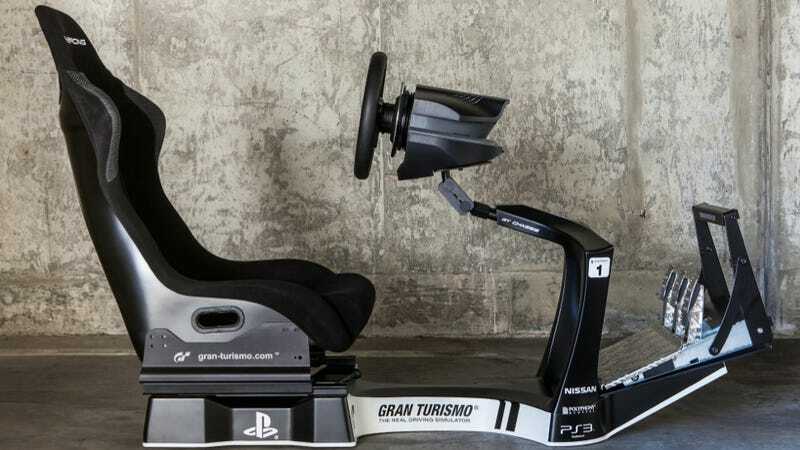 As part of the Jalopnik Film Festival we've snagged one of these gorgeous Gran Turismo simulators. Want to win it? Since you'll be able to draw your own track in GT6 we want you to draw us your own dream track, put it in the comments, and we'll pick the best one and send the winner this can't-buy-it-anywhere rig, autographed by all the awesome people who'll be at the Film Fest. You don't have to come to the Jalopnik Film Festival next week in NYC (although, if you want to, tickets are still available) to enter the contest, but if you are going to the party you'll get to play Gran Turismo 6 in a few of the simulators that GT is bringing along. Feel left out of the fun? No worries. One of the features of GT6 we're most looking forward to is the ability to create your own race tracks using their new course maker tool. How big these tracks can get is up for debate, but we're hearing Nürburgring-dwarfing size. That being the case, we want to give the HumanRacing GT chassis to someone who has a place to use it. So we'll fly it to the Jalopnik Film Festival, get it autographed by a bunch of awesome panelists who are attending, and then send it to the winner. You can't buy this in stores so it's an awesomely limited edition piece of kit. 1. Draw an awesome track: Do it in Photoshop, MSPaint, whatever. I don't care. Just make it awesome and use only images you have the rights to use. 2. Put it in the comments on this post: Just paste it below, if you want to host more images/video/whatever just include a link to that. 3. Do it between now and 5:00 PM EST on Friday, September 13th: We'll pick our favorites and post them on the following Monday, including the winner. The winner gets the rig (also, check back so we can contact you)! Additionally, all Gawker Contest Rules apply.